Something amazing happened yesterday. Something I personally have been hoping and waiting for, for a long time. AMD’s FreeSync 2 technology is finally coming to game consoles. Microsoft announced yesterday that it’s officially bringing AMD FreeSync 2 support to the XBOX ONE X and XBOX ONE S with its spring update. This is an absolutely massive deal and something gamers familiar with FreeSync will surely be extremely excited about. In June of last year I published an editorial on how literally game-changing variable refresh rate technology, i.e. FreeSync, would be for console gaming and why both Microsoft and Sony should seriously consider supporting it on their latest XBOX ONE X and Playstation 4 Pro. I’m going to start off with a quote from my editorial from a couple years back, because it kind of explains everything. Attempting to force the incredibly complex game worlds of today’s games to adhere to a fixed framerate is like trying to tame a lion. It’s extraordinarily challenging and any failures or hiccups will lead to catastrophic outcomes. FreeSync, solves all of this. 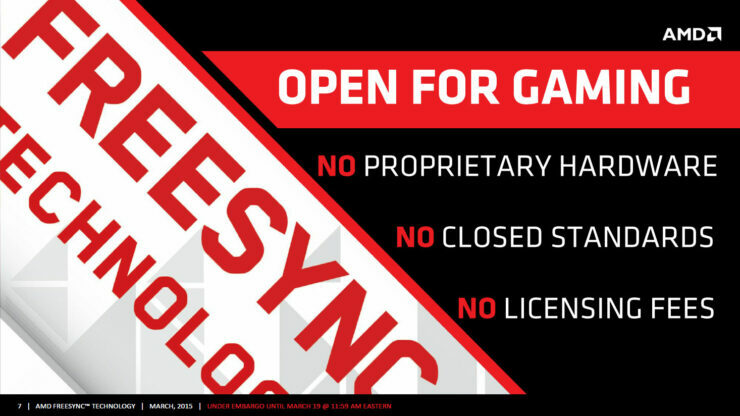 In a nutshell, FreeSync completely gets rid of tearing AND makes your game run smoother. Tearing is not something that console gamers would normally see, as games on the consoles would normally be either fixed to a framerate of 30 or 60 FPS with V-Sync enabled. However, V-Sync introduces lag, a lot of it in many cases. This means that even if we exclude screen tearing from the equation, there’s still virtually no situation where an adapative refresh rate, i.e. FreeSync, is not superior to a fixed refresh rate. 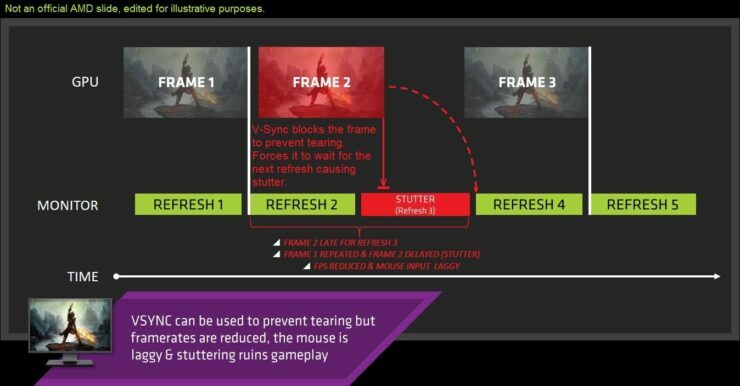 Let’s starting by talking about V-Sync, which is a frame delivery technique that forces your game to stay in sync with your display’s refresh rate. 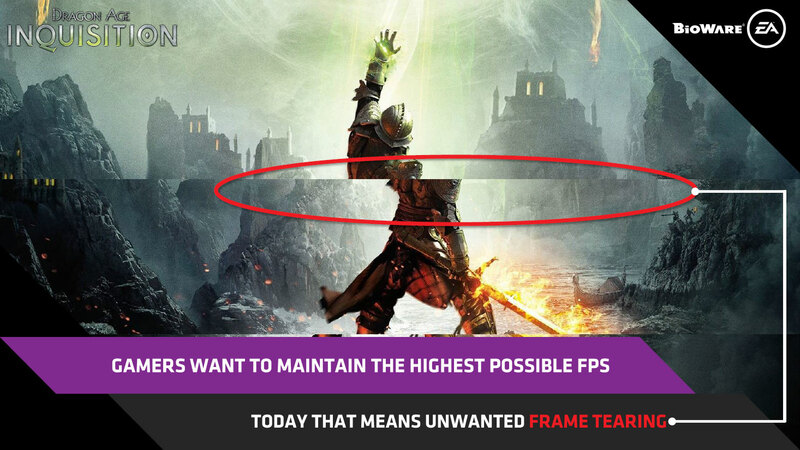 It does this by limiting your game’s FPS to a fixed 30 or 60 frames per second. In contrast, FreeSync allows your display to run at a dynamic refresh rate and simply match the game’s variable framerate in real-time. To understand why this is so important we have to understand why we need V-Syn in the first place. Traditional displays, like the TV you have hooked up to your game console, deliver images at a fixed rate. Be it 60 times every second, 30 times a second or even up to 144 times a second as is the case on high-end gaming monitors. This creates a huge problem, because games just don’t work like this. The hardware inside your gaming device is always working to process & deliver game images “frames” as fast as it possibly can. Modern games have an incredibly wide variety of environments and scenes, some of which are naturally far more visually and computationally intensive than others, which is why framerates can vary greatly from one moment to the next, as some frames will take more time to process and display. This makes the framerate of modern games inherently variable, while your display’s refresh rate is the very opposite of that. To address this disparity V-Sync is used. Vertical Sync, as the name implies, syncs every frame with the vertical refresh rate of your monitor. It works by forcing each newly rendered frame to wait for its turn. It has to wait for the next refresh cycle, there’s one cycle every 16.6 milliseconds on a typical 60Hz display. As soon as the last cycle ends and a new one starts, it begins drawing the frame on the display. And that’s when you actually get to see it. This makes sure that every frame is always in sync with the display. This ensures that no screen tearing occurs, which is introduced when the display begins drawing a frame in the middle of a refresh cycle. But, as explained above, because frames aren’t displayed as soon as they’re rendered and have to “wait” every time for a new refresh cycle this introduces lag. As a result, the image you see in front of you will actually be lagging behind what is actually happening in the game. And if your framerate drops below its 60 or 30 target, this lag grows exponentially worse because the display will have to draw the same frame twice, on two subsequent refresh cycles, until it receives a new rendered frame to display. 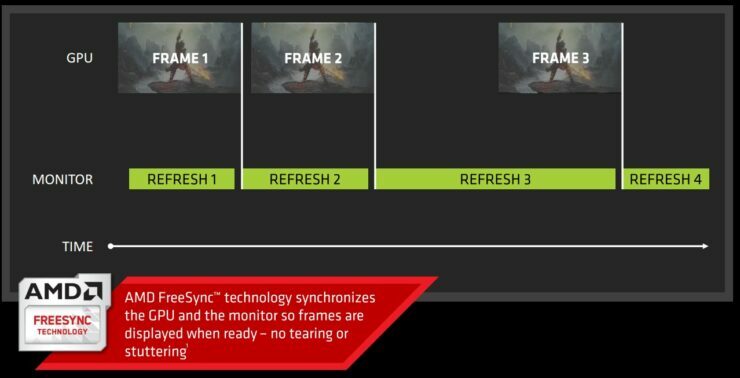 If you want to read more about variable refresh rate technology & how it works you can check out our in-depth technical write-up where we break down everything concerning AMD’s FreeSync & the comparable solution from Nvidia called G-Sync. Well, several things. First, for game developers it means they can build richer and more dynamic worlds without having to worry about an arbitrary 30 or 60 framerate limit. For gamers it means smoother gameplay and much more fluid game control and response. For TV makers it means they will now have to introduce TVs that support FreeSync. There are already over 100 displays that support the technology on the market, but none of them are TVs. This will undoubtedly change very soon. FreeSync actually costs very little to implement because it doesn’t require any special hardware. It relies on an industry standard and all the processing required is taken care of by the scalar chip that already exist within the display. It’s also officially supported on the HDMI standard, something that AMD introduced a couple of years back in anticipation of console makers embracing the technology. The Playstation 4 Pro graphics hardware is based on the same well established PC graphics architecture that AMD continues to sell today, so there’s no question that it supports FreeSync. We expect to hear a similar announcement from Sony about bringing FreeSync support to the Playstation 4 Pro in the near future. So stay tuned PS4 gamers, you will not miss out!